What is this democracy Pakistan keep referring to? Home Opinion What is this democracy Pakistan keeps referring to? What is this democracy Pakistan keeps referring to? As a consequence of continuous appeasement of military in Pakistan, the current ‘arrangement’ has given khakis authority to call shots. Just last month in Delhi, a family of eleven committed collective suicide. Initially, it looked as if there must be some wicked perpetrator behind this chilling mass suicide; however, not before it was too late, the police found out that the deaths were result of a shared psychological disorder that this unfortunate family lived with. It was discovered that under the helm of the head of this household, the family members took their lives with an expectation that when the ritual is over they will have the worldly salvation. Instead of taking the problems head-on, what this unfortunate family opted for was to deal with their problems through dogma. Somewhat similar dogmatism has been on display by Pakistan’s political parties when it comes to their desire to gain political salvation through civilian supremacy and democratic rights in Pakistan. Instead of confronting the institutional encroachment by the military establishment at the expense of other pillars of the state, the political leadership in government and opposition have more often conceded, self-restrained or altogether appeased the military junta with a misplaced hope that this will gradually bring them to democracy’s side. From the Hamoodur Rehman Commission to the Abbottabad Commission, nobody in the military or the intelligence agencies has ever been held responsible for their wrongdoings. To add insult to injury, even the inquiry reports were never released on the pretext that this would demoralise the armed forces. During the Pakistan People’s Party’s (PPP) tenure from 2008-2013, the civilian leadership compromised all it could in matters of national security, foreign policy and defence. Even so, all sorts of artificial crises such as Memogate were created to keep the government on its toes. In 2014, during the Pakistan Awami Tehreek (PAT) and Pakistan Tehreek-e-Insaf’s (PTI) Dharna, then Prime Minister (PM) Nawaz Sharif had shared proof with COAS Raheel Sharif which showed that then DG ISI General Zaheerul Islam was orchestrating the Dharna. Even so, no action was initiated against him. Ironically, when a year later Nawaz Sharif’s close aide and federal minister Mushahidullah Khan divulged information about this incident, the displeasure from military establishment was intense and could only be cooled with the offending minister’s removal. In the wake of the highly contentious elections on July 25, the bad mood of the Pakistan Muslim League-Nawaz (PML-N), PPP, Awami National Party (ANP) and Jamiat Ulema Islam (JUI) is certainly understandable. These elections were seriously marred by the uneven playing field created by the National Accountability Bureau (NAB), a partisan judiciary and the not-so-secret work of a certain unofficial “Agriculture Department”. Once the polling was over, there were many issues with vote counting as well. There was no plausible explanation for results from cities like Karachi, Lahore and Islamabad taking as much as two to three days. This was then followed by whimsical decisions by Returning Officers and the courts on recounting appeals from runner-up candidates. In the midst of all this, the Chief Justice of Pakistan (CJP) has the audacity to meet the leaders of PTI twice. 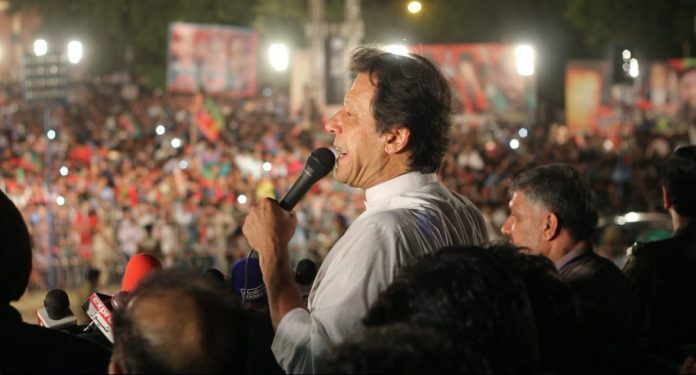 The political commentators who are critical of the way elections have been conducted and of the key institutions of the state such as NAB, military establishment, and apex courts have been frequently gagged. On the other hand, sectarian elements have been allowed to be part of the electoral process at the expense of popular political parties, which will only add regressive aspects to the national political narrative. In this context, when there’s hardly anything which might be promoting a democratic value except a façade of democratic set up, the advice from political commentators embedded with military establishment for accepting the elections results for the sake of the continuity of the democratic system sounds outrageous. One wonders what democratic system these political analysts are actually referring to. What we are living under is already a velvet martial law. As a consequence of the civilians’ continuous appeasement of the military, the current ‘arrangement’ has given the khakis authority to call all the shots. However, responsibility and accountability still fall on the mostly helpless civilian political leadership. Now the PPP, PML-N, JUI and ANP have left nothing left to lose. Hence they should not be overly concerned about continuity of this dystopian system but agitate and protest. Even if they don’t succeed, they will compel the movers and shakers of this democratic façade to come out in the open and be responsible. Next articleDoes ethnic diversity help or harm India’s economy?